Excerpt from Chapter 2 of my book, Letter VII: Joseph Smith and Oliver Cowdery Explain the Hill Cumorah. 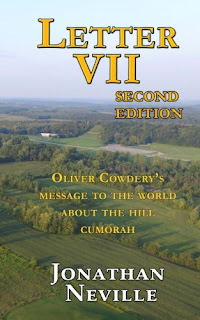 President Cowdery wrote Letter VII with the assistance of Joseph Smith and published it in 1835. Joseph had it copied into his personal history and saw that it was republished in Church publications during his lifetime so every member of the Church could learn the truth. Letter VII was published in New York City just two days after Joseph was murdered in Carthage. Each of us views the world through our own filters. We have biases. Think about your own biases as you read this (or any other) book. Consider the biases of the author. Here is my bias. You can agree or disagree, but you should know that this is the filter I use to assess the facts. Because Joseph and Oliver worked together on these letters, and because Joseph endorsed them repeatedly after they were published, I consider these letters, including Letter VII, as the testimony of two witnesses. Their dual witness is the foundation of our beliefs about the restoration of Priesthood keys, the translation of the Book of Mormon, and more. Letter VII is no different. My bias extends to all the prophets and apostles who have affirmed Letter VII’s teaching about Cumorah in New York, including members of the First Presidency speaking in General Conference. Scholars and educators who reject Letter VII have a different bias. Because they believe Joseph and Oliver were wrong, they think Letter VII deserves no deference. They think every prophet and apostle who has taught that Cumorah is in New York was perpetrating a false tradition. Keep these distinct biases in mind as you read the rest of this book, as well as any book on the topic. Ask which bias more closely reflects your own bias.